SEATTLE, Oct. 2, 2017 /PRNewswire/ -- Nordstrom, Inc. (NYSE: JWN) celebrates women of all shapes and sizes with its extended sizing initiative launching at its new Century City store opening on October 3. Most women's contemporary brands start with size 2 or 4 and go up to size 12. Plus size brands typically range from size 18 to 24. Nordstrom is asking its customers' favorite brands to fill the gaps in sizing and expand their size ranges by adding more zeros, 2's, 14's, 16's and 18's. The retailer made progress with denim brands first. 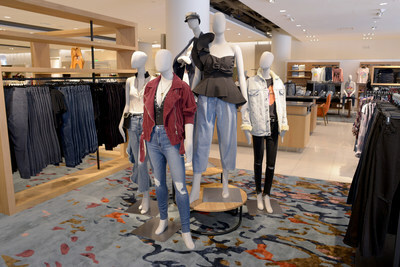 Mannequins in varying sizes--rather the typical size 2--will bring the story to life to create what the retailer hopes is a more inclusive shopping experience in the denim department of its newest store. In addition, the customer centric retailer is integrating all denim sizes together, side by side in one department rather than separating the petite and plus sizes. Participating brands initially include Topshop, Rag & Bone and Madewell as well as the company's private label brands Caslon and Halogen. "Our customers have been asking for a broader range of sizes on both sides of the spectrum – the zeros and 2's and beyond size 12," said Tricia Smith, Nordstrom executive vice president and general merchandise manager for designer, women's and kids apparel. "We recognize the opportunity to serve customers better by having more sizes. Style and fashion apply to everyone. They're not created for a limited group of sizes. We don't view being size inclusive any differently that the need to be more inclusive across the board—whether it's ethnicity, size or body type. In our opinion, petite and plus sizes shouldn't be considered special categories. They're just sizes." Nordstrom is working on a bigger sizing statement for Holiday with about 40 brands committed to offering extended sizes on Nordstrom.com in multiple categories including swimwear, activewear and ready-to-wear. For Spring 2018, the initiative will evolve even further with extended sizes from a total of 60 brands and inclusive sizing in-store experiences in 15 stores. The retailer is not eliminating its existing plus size or petite departments, rather it is working toward filling the gaps in sizes and integrating all sizes together on the selling floor.